Twelve people have walked on the moon, but only one man – Philippe Petit – has ever, or will ever, walk in the immense void between the World Trade Center towers. Guided by his real-life mentor, Papa Rudy and aided by an unlikely band of international recruits, Petit and his gang overcome long odds, betrayals, dissension and countless close calls to conceive and execute their mad plan. I hope it’s not the intention to make a film about every bizarre human achievement. Otherwise we’ll be looking at a whole series of movies. Besides the shown dazzling images, I thought it was just a soporific spectacle. Halfway the movie I dozed off. Fortunately that didn’t happen to Philippe Petit while he was swinging on that steel cord between the Twin Towers. However, there are two things about this film that stand out. First of all, the used camera technique. 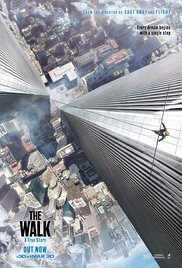 I myself suffer from fear of heights and “The Walk” gave me often anxiety attacks and a spinning sensation. It managed to get me as far as holding my hands in front of my eyes. You won’t see me do that even during the most terrifying horror. And then there’s Joseph “Looper” Gordon-Levitt talking with a French accent. Although he could have made a caricature out of Petit easily, he managed to play the driven, passionate Frenchman with gusto. Already from the opening scene you know what you can expect. Philippe speaks to the public from the top of the Statue of Liberty and introduces this true story. The way he tells the story with enthusiasm and emotion, ensures that your curiosity is aroused. Did he succeed in this dangerous undertaking? Or is he speaking to us from heaven, after he smashed to bits and ended up as a human pizza between the two majestic towers? Those who know the real story, know the outcome of course. And furthermore Phillippe also reveals the ultimate goal early on in the film. So we can’t speak of a surprise element anymore. The first part is about Philippe working as a street artist in Paris. It’s there that his passion for walking the wire started. With the help of the circus owner Papa Rudy (Ben Kingsley), whose family practiced tightrope walking for years, he learns the tricks of the trade. And when he reads an article about the construction of the Twin Towers, he only has one goal in his life and that’s to cross the yawning depth between the two towers while walking that rope. What follows is a kind of “Ocean Eleven“, to make sure this stunt will be a success. The moment Philippe decides to fulfill this dream, the preparations begin. Figuring out how to achieve it and what equipment is required. Assembling a group of accomplices and create a detailed plan so that nothing would go wrong the day Philippe tries his luck. The second part is about the implementation of this plan. Of course you can expect some setbacks and unexpected obstacles during the attempt, so that it becomes more intense and exciting. Gordon-Levitt played his role with bravura and with conviction, although the forced sounding accent bothered me at the beginning. All the time I was wondering why they hadn’t chosen an authentic French actor. But as the film progressed, I thought it was an admirable performance off him. Kingsley‘s part was extremely funny. But for me the two helping hands from the United States, summoned by a shop owner, were really amusing. Charlotte Le Bon is a lovable and frail appearance, but served merely as an attribute (such as the flexible stick Philippe uses during his tightrope walking) in a parallel storyline. All in all an entertaining and at times terribly intense film. But it didn’t reach the same level as Philippe did during his famous act. PS. Finally I want to mention that I find it a huge achievement from the filmmakers they weren’t tempted to make it a kind of tribute to the Twin Towers and avoided to use any reference to what ultimately happened with these towers.